Quotes Find: You read about all these terrorists--most of them came here legally, but they hung around on these expired visas, some for as long as 10-15 years. Now, compare that to Blockbuster: you're two days late with a video and those people are all over you. 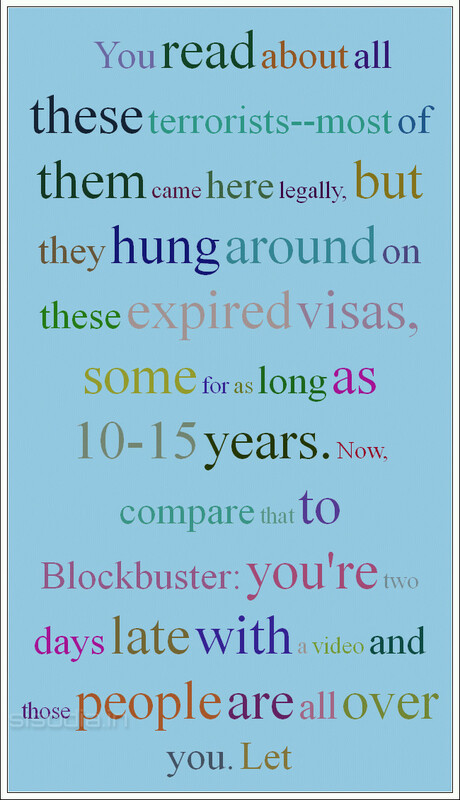 Let's put Blockbuster in charge of immigration. You read about all these terrorists--most of them came here legally, but they hung around on these expired visas, some for as long as 10-15 years. Now, compare that to Blockbuster: you're two days late with a video and those people are all over you. Let's put Blockbuster in charge of immigration.